PHOENIX — The Children First Leadership Academy in Phoenix was given a big, fat F by the Arizona Department of Education’s new rating system, but one reason its academic success is low may be a shortage of funding for the population the school serves. Children First is made up entirely of students who are living below the poverty line, 56 percent of whom are homeless as defined by the McKinney-Vento Act. The K-8 school, which is part of the Sequoia Schools, operates almost entirely on donations and strives to provide students with more than just an education. On top of education, the school offers students access to health care, food, clothing, after-school programs and more. Children First aims to equip kids with leadership and life lessons by teaching the kids money management, personal hygiene, gardening and cooking skills. Lewis said they focus on helping the kids while they are at school because there is little administrators can do to help their parents. “So we try to make a difference with the kids; that’s where we’re going to make a change,” Lewis said. Eighth grade teacher Megan Wallace explains there are many barriers for these children to be academically successful, including their home life. 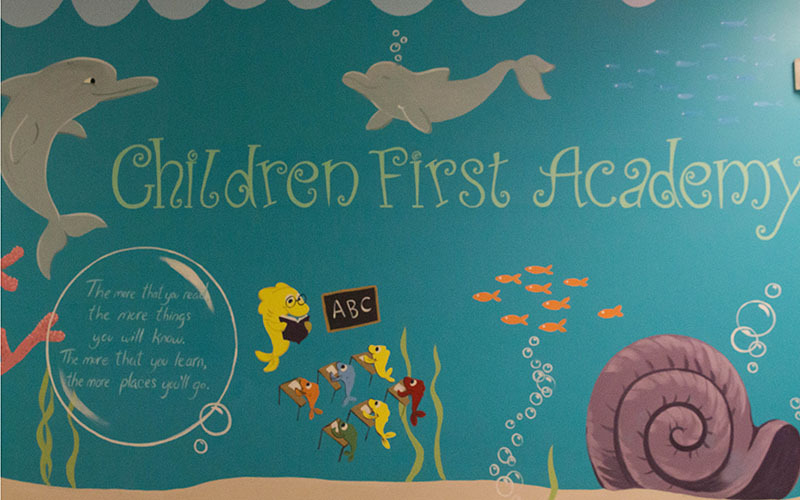 The Children First charter has been active since 2008 when Edkey, Inc. took over the charter from the Thomas J. Pappas School for the Homeless, which was shut down due to financial difficulties. Now, this charter school is facing the same problem. Lewis said in order to improve performance, the school needs more funding so it can hire additional staff at competitive rates. “With the teacher shortage, trying to find someone in this state, right now, that wants to work here, for what we pay—it’s a miracle we get anybody,” Lewis said. The school hopes to hire paraprofessionals to work part-time in assisting with more one-on-one learning. At another Edkey charter school in Tempe, Children First Academy, the school was able to gain grant funding to hire more paraprofessionals, something the Phoenix campus hopes to find. According to charter administrators, in 2009 Children First Academy Tempe was rated by the state as “underperforming” in academics. But with the grant funding to hire an additional 11 paraprofessionals on campus, the school’s rating jumped to “performing plus” in 2010, skipping over the “performing” category altogether to show huge improvements in just one year. While the Tempe location received grant dollars to fund hirings, the Phoenix campus is still searching for funding opportunities. As a teacher, Wallace agreed that staffing could make a big difference and start changing the school’s ranking.